I've made a lot of fresh chorizo, but this is the first time I decided to make my own. 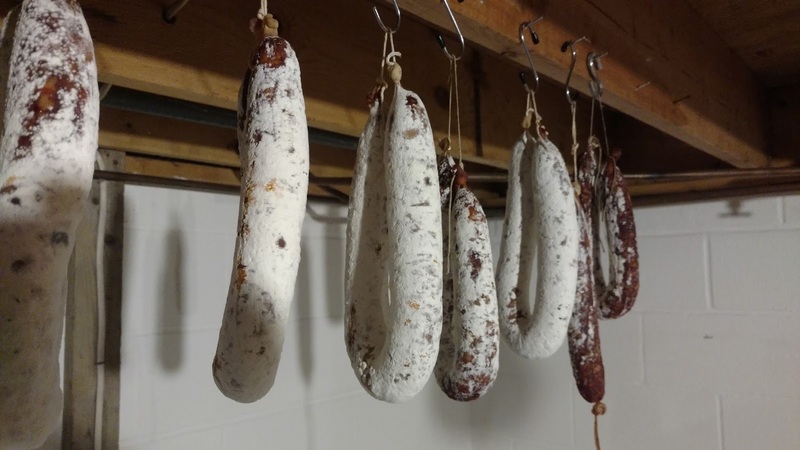 It's funny, I began to think back to all the salami I've made and it seemed crazy to think I hadn't made dry-cured chorizo. It's such a staple, but perhaps because good quality chorizo is widely available I haven't been in a rush to make my own. So down the rabbit hole we go! To give credit where it's due, this chorizo was inspired by Evan's Craft Butcher's Pantry and all the cool new chorizo seasonings they brought in this fall. Just read this description of the piquillos! The peppers are roasted over wood fire, then pealed by hand, and packed. No water touches the peppers after roasting! 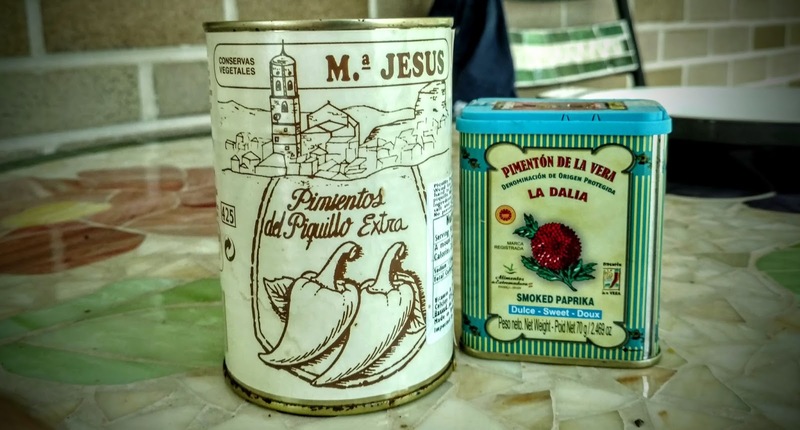 Evan also sells a really nice pimenton de la vera in bulk tins, but I actually have a small retail tin that was perfect for this 9# batch. I pureed the piquillos without any additional water, per Evan's instructions to keep the flavor pure. 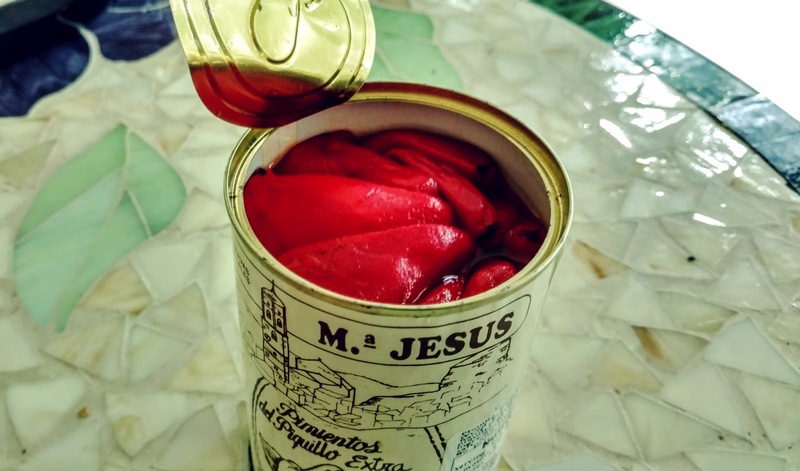 Now, as much as some of these specialty items get flowery text attached to them, these peppers really seem like an authentic handmade item. 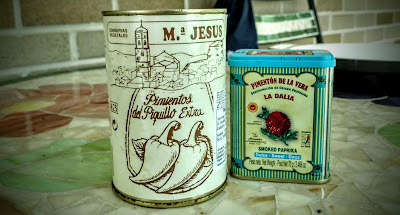 They're even carefully packed into the tins, not randomly slopped in by some industrial chute. I didn't do too much experimenting with this first batch of chorizo - just salt, pepper, pimenton, 2% puree piquillos, and fresh garlic. I did grind about 1.5 lbs of Berkshire pork shoulder on a coarser plate to give the chorizo a slightly variegated texture/appearance. 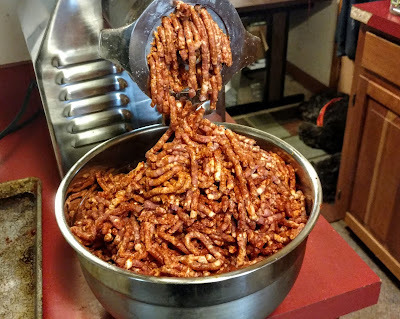 Finally, to give the classic "horseshoe" look, I stuffed the meat paste into cut and tied beef rounds. They're looking really nice so far, with a health coating of mold blooming away. See you in a few weeks, baby chorizos!